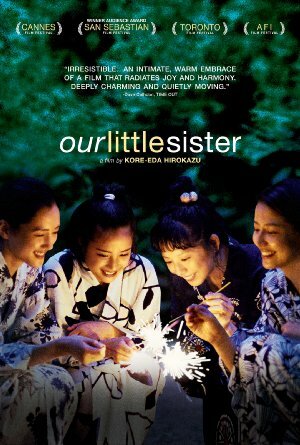 "Our Little Sister", directed by Hirozaku Kore-eda, is adapted from Yoshida Akimi's best-selling graphic novel "Umimachi Diary". Three twenty-something sisters - Sachi, Yoshino and Chika - live together in a large old house in the seaside town of Kamakura. When they learn of their estranged father's death, they decide to travel to the countryside for his funeral. There they meet their shy teenage half-sister Suzu for the first time and, bonding quickly, invite her to live with them. Suzu eagerly agrees, and begins a new life with her older sisters. At a time when adaptations of comic or mangas so often means big budgets, action, and lots of CGI, Our Little Sister is a distinctly different kind of tale. The story is a modest one, of four sisters working through conflict to reconcile themselves with their past to better face their futures. It's a film light on exposition and direct confrontation, with most of the most dramatic events happening before the opening of the film or offscreen. Instead of focusing on drama, the film instead focuses on how the four sisters go through their day to day lives with their past history as a backdrop. The story has minimal direct exposition of their circumstance or history, we come to know them as they are first, and then continue to slowly learn more about their history as the story develops. The effect is one of accumulating attachment to these characters and their connection to each other, the home they live in, and their relationships with others they care about. It's a movie that builds its hold on you as it goes along rather than demanding attention through spectacle. The only fireworks in the film are, well, fireworks that accompany one of the seasonal changes that show the passing of time. Meal times provide much of the structure to the film, where the characters gather to discuss events or develop bonds with each other. It's story where people care about each other and seek ways to improve their conditions through consideration of action rather than seeking or drawing out conflict. As such it may seem rather light or empty in some way compared to more typical dramatic storytelling, but its in seeing these characters seek to resolve conflict before it grows that gives the story much of its power as one becomes familiar with their lives and understands why they all behave as they do despite reasons for potentially acting otherwise. It's a decidedly domestic scale of heroism, in a sense, but one which is no less important for being so. I don't want to reveal too many details since I suspect most people may not have heard of the film yet, but I strongly recommend it in hopes of both getting more people to see the movie and in perhaps sparking some further discussion from that. I would also happily recommend many of Hirokazu Kore-eda's other films to anyone interested in this one. Marborosi, After Life, Hana, Still Walking, and Nobody Knows are all worth seeing, and I gather his other films are as well, but those are pleasures I still await myself. I super want to see this! And I want to see this, too, but haven't.